The quote amply explains why having and setting goals are so vital not just for companies but from an individual’s perspective too. There are a plethora of tool and methods currently in practice and a number of tools that claim to help with goal setting. For me, I believe that goal setting is all about personal development and each person must follow the method and apply the tools that will help them grow personally through the achievement of their goals. 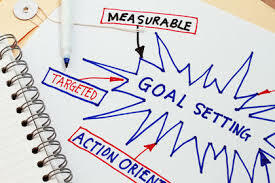 I have been around long enough and seen a lot professionally and personally to know that goal setting does not need to be a daunting and intimidating exercise and a few pertinent strides will suffice to help one grow in all aspects of life. 	Start at the beginning – that is common sense. Analyse the root-cause that has persuaded you to think about this particular goal. Make a list of the things that you consider to be stumbling blocks to the accomplishment of the goal and pit them against the actions required. For instance, when my doctor told me that I needed to lose weight, the first thing I did was to figure out what I did wrong that contributed to the excess weight. My goal was to get fit and stay healthy rather than following mindless diets that would crash the weight but rob my body of essential nutrients. 	With a clear goal in mind, it was much simpler to put down a set of methods and practices that would help me achieve my goal. When the goal is clear and the stepping stones are in place, the chances of success are much higher. 	Enlist the help of someone who has had a similar problem and overcome it. This not only helps you stick to your plan to achieve your goal, but also provides you with the necessary support and determination required in attaining what you have set out to do. Such a person will serve as an inspiration, a stimulus and an encouragement – call it what you will – it is crucial to the success of your own personal goal. 	The reality however is that no plan or support will help, if you lack focus and steadfastness. The determination of making something happen must come from you – from the deep desire to accomplish your goal. Weave the plan in to your everyday life – make it a habit – we all know that habits are hard to break and therefore easier to stick with. Goal setting for personal development or professional growth means that you are already committed to make changes in your life for the better. I believe that the achievement of anything is a mind-set – positive and resolute. This perseverance and a single-minded focus will be the cornerstones in the achievement of these goals. Take small steps and as you overcome each one, your confidence will steadily build and each subsequent step will become easier and more achievable as you move along. It’s been working for me!